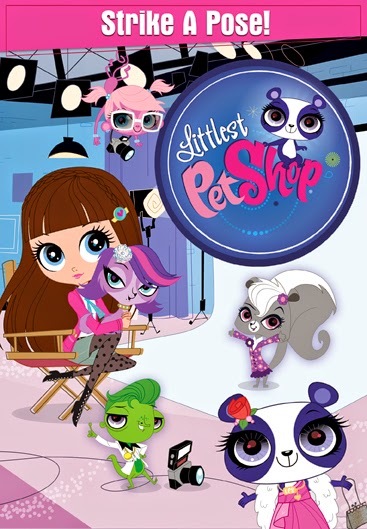 On June 3rd, 2014 Shout Factory Kids, in collaboration with Hasbro Studios, will release Littlest Pet Shop: Strike A Pose! on DVD! This collection will include 5 episodes featuring Blythe Baxter (Ashleigh Ball) as well as a sing-along. The boys love Littlest Pet Shop as it's such an adorable show. Dane was super excited to hear we would be reviewing another one since he just loves the show so much! The synopsis says "Blythe and her best friends — Zoe the spaniel, Pepper the skunk, Sunil the mongoose, Russell the hedgehog, Penny the panda and Minka the monkey — are back for five more exciting adventures in the Littlest Pet Shop! Sunil becomes an internet phenomenon, Vinnie befriends some dancing lizards and the Pet Shop welcomes a juvenile alligator into their midst! All of these adventures and more unfold in these five wild episodes of Littlest Pet Shop!" My favorite episode on this DVD is "The Big Feathered Parade" because Blythe gets her designs stolen but the figures out it was Ramone. In the end Blythe gets credited for her designs. I enjoy mysteries, so for me this episode was the most entertaining. Littlest Pet Shop isn't as corny and cheesy as I feel most children's shows can be so I actually watch this one with Boys even if it's the same episodes multiple times. Every time it comes on TV, Dane forgets everything else and has to watch it. I think he has memorized just about every episode actually. I've said this before but I personally think the show is amazing, it teaches good values and to have a good attitude about things not going your way. Recommendation: Both boys enjoyed watching this and I thought the lessons were fantastic as usual! I just love how this program teaches everyone to be proud of who they are! I definitely think at $15 its worth it to purchase.